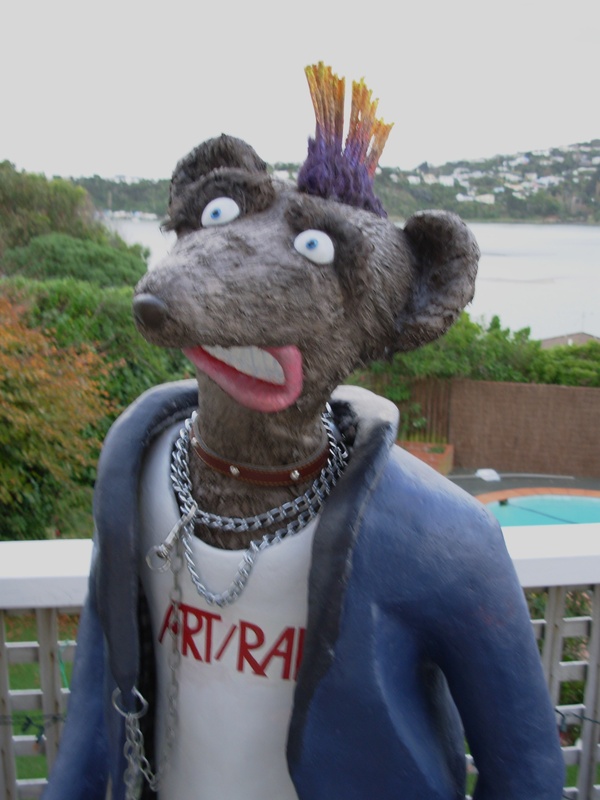 This is Johnny Ratten, the punk rat. He’s 1.5m tall. His stance is based on a Billy Idol photo and gives him good balance whichever way he is knocked. He’s made of various woods, newspaper and chicken mesh as a base; a wallpaper, paper mache, fake fur and cardboard exterior plus cloth and windbreak jacket, all painted with acrylics; ping pong ball eyes, polystyrene mouth, pipe cleaner hair and accessories. Love him. If I wasn’t married, I’d definitely be boarding the next flight over the ditch!